Lockheed Martin Corp.’s LMT business segment, Aeronautics, recently clinched a modification contract to procure air vehicle initial spare parts for the F-35 Lightning III aircraft. Work related to the deal is scheduled to be over by December 2023. Valued at $81 million, the contract was awarded by the Naval Air Systems Command, Patuxent River, MD. Per the terms of the agreement, the spare parts to be supplied by Lockheed Martin include afloat spares packages, Marine Corps quick engine change kits and associated consumables. This deal will support the air vehicle delivery schedules for Navy and Marine Corps. The majority of the work will be carried out in Fort Worth, TX; El Segundo and Torrance, CA; Owego, NY; Samlesbury, United Kingdom; Cheltenham, United Kingdom and Nashua, NH. The company will utilize fiscal 2018 aircraft procurement (Navy and Marine Corps) funds to finance the contract. The deal includes 54% of the work for the U.S. Navy and 46% for the U.S. Marine Corps. F-35 Lightning is a supersonic, multi-role fighter jet, which represents a quantum leap in air-dominance capability, offering enhanced lethality and survivability in hostile, anti-access airspace environments. Its advanced stealth allows pilots to penetrate into areas without being detected by enemy radars. It is being used by the defense forces of the United States and 11 other nations, worldwide, largely due to its advanced stealth, integrated avionics, sensor fusion, superior logistics support and powerful integrated sensors capabilities. 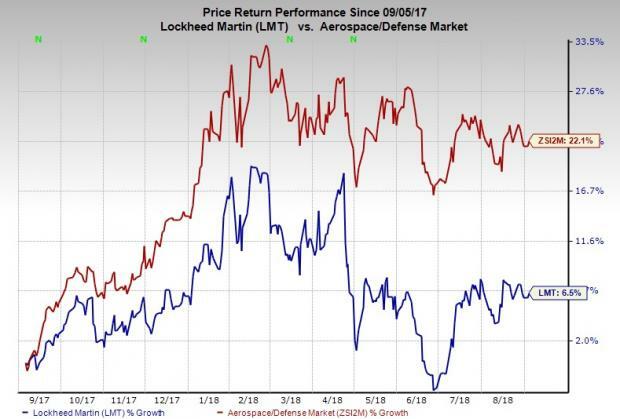 Lockheed Martin’s stock has gained about 6.5% in the past year compared with the industry’s growth of 22.1%. The underperformance may be due to intense competition that the company faces in the aerospace-defense space for its broad portfolio of products and services, both domestically as well as internationally. Lockheed Martin currently carries a Zacks Rank #3 (Hold). A few better-ranked stocks in the same sector are Aerojet Rocketdyne Holdings AJRD, Engility Holdings EGL and Huntington Ingalls Industries HII.